Eternity on a Rock: How would you win this game show? You are in a game show with nineteen other players. You don't know the other players, you can't see them, and you can't communicate with them. The game you are in is called 'Greed! ', and is straightforward to explain. 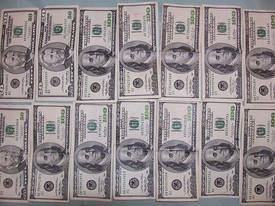 You are asked to write down a whole dollar amount in the range $1 - $1,000,000 on a piece of paper. You will be paid the amount you asked for if it is deemed to be 'non-greedy'. Whether your request is indeed 'non-greedy' will be decided once all twenty request have been received by the host of the show. Your requested amount will be labeled 'non-greedy' if no other player has asked for less, and at least one player has asked for more.